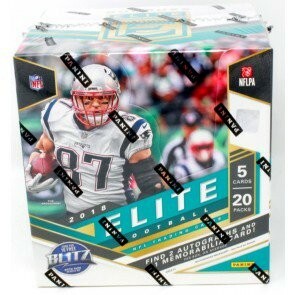 - One of the highlights of the calender every year is back again with new inserts, new parallels to chase, and all the top rookies from the 2018 NFL Draft. - Chase all the new NFL rookies in their professional uniforms which parallel from the Rookies (max #’d /699), Rookies Aspirations/Status (max #’d /99), Rookies Aspirations/Status Die Cut (#’d /24), Rookies Orange (#’d /25), Rookies Blue (#’d /10), and Rookies Black (#’d 1/1). - The always popular Pen Pals and Pen Pals Dual will feature on-card autographs of the top rookies with black, blue, green, and red variations! - New inserts to 2018 Elite are Dual Threats, Elite Deck, Captain Clutch, and Hard Hats. Each of these inserts come with a fresh look and is loaded with the top future, present, and past players in the NFL. - Look for Turn of the Century Autographs from the top rookies of the 2018 NFL Draft Class, all #’d/199 or less! This 100-card base set will feature all of the top talent the NFL has to offer and some of the first cards of players on their new teams! A deep 100-card rookie checklist will have all the top players from the 2018 NFL Draft in their professional jerseys #’d to 699 or less! Passing the Torch Signatures Doubles highlights some of the greatest players ever paired with a rising super star for a combination that is sure to captivate. Pen Pals features bold on-card autographs of the top rookies from the 2018 NFL Draft with black, blue, green and red ink variations. Team Lineage Signatures shows the progression of greatness for teams throughout the years (max #’d /15)! Highlighting some of the most elite players in NFL history, names like Randy Moss, Joe Namath and Jerry Rice are just a few of the many greats in Elite Signatures (max #’d /99)! With a vintage design Throwback Threads is loaded with NFL legends and Hall of Famers, also hunt for prime versions (#’d /15)! From first-ballot Hall of Famers to up-and-coming stars Impact Impressions highlights the top defensive players in the NFL (max #’d /99). Rookie Elitist showcases the best college players that are sure to make a major impact in the NFL. Chase the gold (#’d /25) and the black (#’d 1/1) to complete the set.